Oh Oncers, it feels like it’s been so long. In case you need a refresher: Peter Pan unleashed a curse on Stroybrooke that sent everyone back to the Enchanted Forest except Emma and Henry. They were given new happy memories courtesy of Regina. Also, Rumple (seemingly) sacrificed himself to kill Pan and save everyone. One year later, Hook showed up at Emma’s apartment door to tell the Miss Swan her family needed her. She kneed him in the groin. All set? Our World, One Year Later. A very posh looking Emma arrives for a date with her Billy Bob Thorton lookalike boyfriend. After dinner, he excused himself for a moment and Hook snags his seat. Emma still isn’t buying his story about the Enchanted Forest and all that but he does correctly guess that she has some niggling doubts about her life, her parents, etc. He gives her an address where she can find answers to those questions. Enchanted Forest. Phillip and Aurora get the cliff notes version of why everyone is back but in a bad showing of quid pro quo, they don’t mention anything about a certain Wicked something that’s popped up. 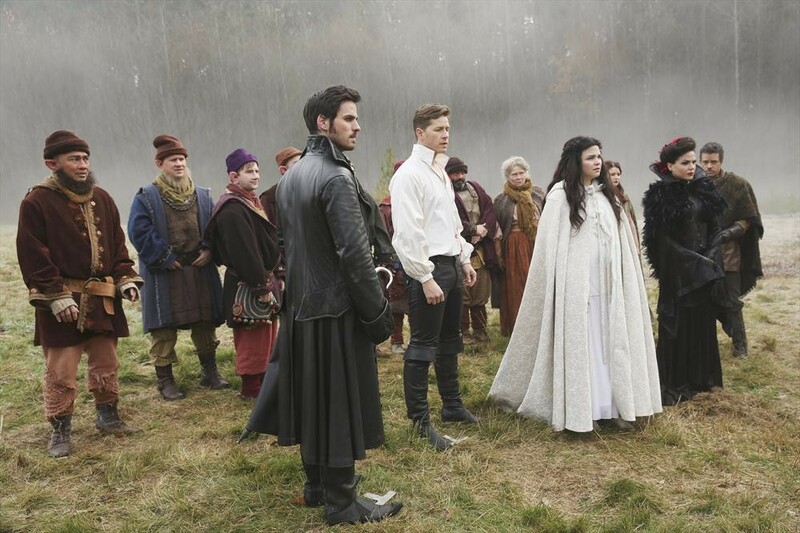 The Storybrooke troupe head towards Regina’s castle for shelter, since Snow and Charming’s was destroyed long ago. Back at dinner in New York, Billy Bob proposes via an ice cream sundae. It’s cute but Emma looks more mortified than impressed. Commercial. Emma bolts from the restaurant because she and Billy Bob have only been together eight months and she’s freaked. Seems reasonable really. He tells her he’ll wait until she’s ready and she says she does love him. That’s something, I guess. At home, Emma joins Henry in some video games and he offers his adult mother some sage advice: not every man is like his father, who even in this alternate reality still let Emma go to prison for him. Charming is back in full prince swing, swoopy hair and all but he can’t convince Hook to join them. The pirate gallops off to find his Jolly Roger and get on with his scallywag lifestyle. Bae wants to check the Dark Castle for his dad and for a way to get back to Emma. Much as she hates to say it, Snow reminds him that there’s no way back. This is it; no takebacks, no returns, no portals. Only another curse can return them to our land. After Henry heads off for school, Emma’s curiosity gets the better of her and she goes to the address Hook left her. It’s Neal’s apartment. There she finds a bloody rag, a dream catcher and a camera strap with Henry’s name on it. Commercial. Emma meets Hook at Central Park. He repeats that her parents are in danger, their kingdom has been cursed and they need her help. He offers her a potion to restore her real memories and she considers for a second…before handcuffing him to a park bench and calling the cops. Guess alternate reality Emma isn’t as swayed by Hook’s charms. Enchanted Forest. Grumpy reports that Regina is missing en route to the castle. Snow finds her burying her own heart in the forest. The pain of missing Henry has caused the Queen to take such action but Snow reminds Regina that Henry would want her to be happy. That can only happen if she has her heart. Also, didn’t she learn anything from her literally heartless mother? Regina puts her back in its place but before they can rejoin the company, a creature swoops down on them from the sky. Commercial. As they’re attacked, Snow is “let’s find cover” but Regina, being awesome, prefers throwing some magic fireballs. The flying monkey scratches her for her trouble but Robin Hood eventually comes to their rescue. We have a delightfully snarky meet-cute between him and Regina and I cannot wait for this ship to set sail! Having seen Neal’s apartment, Emma is now suddenly convinced that she should marry Billy Bob. Then she takes a look at the pictures from Henry’s camera, which show Storybrooke and such, and it’s enough to make her spring Hook from the “brig,” as he says. In her guts Emma knows something isn’t right about her life so she downs the potion from Hook. All her Storybrooke memories return in a flash. “Did you miss me?” Hook smirks. Now joined up with Robin’s band of Merry Men, the Storybrooke company continues on. At the castle grounds, Regina finds a protection spell around her abode and she is pissed. Robin offers Sherwood Forest as a temporary refuge and Regina vows vengeance on whomever has stolen her castle. At the dinner in her apartment that she’s supposed to be having with Billy Bob, Hook huskily tells Emma that he had returned to a life of pirating when he received a message: Emma was needed to save the Enchanted Forest…again. So he came looking for her because there wasn’t anything for him in the Forest *hint hint*. Billy Bob buzzes up to Emma’s apartment and she takes him to the roof to let him down as easily as she can. He’s not very forgiving but is mostly mad that she drank the potion. Whoa plot twist! Billy Bob transforms into a flying monkey and attacks. Emma fights him off and tells Hook they leave in the morning. Commercial. Emma questions Henry to see if he might know anything about magic but he doesn’t. He is, however, going with her on her “new case” in Maine. 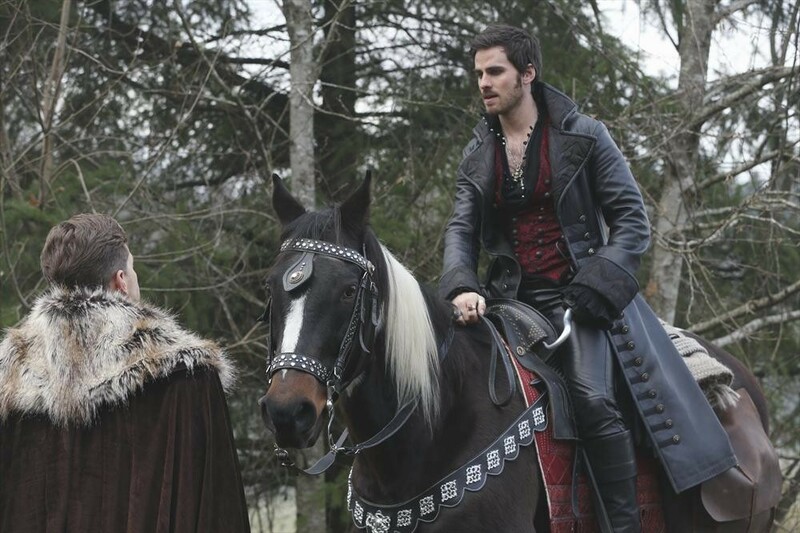 Hook’s coming too and so is the trusty red leather jacket. They drive into Storybrooke, which is inexplicably there. So is David. And Snow. What was that Snow said earlier about a curse being the only way they could return to our world? Well guess what happened? Another curse, one that stole all their memories of the last year but thankfully nothing else. I say thankfully because if we had to repeat Season One’s amnesia plot I might’ve thrown something. In the Enchanted Forest, The Wicked Witch takes some drops of Regina’s blood for the flying monkey and makes a potion. “She’s pregnant and I’m the one who’s sick.” Regina in response to the prince and princesses mushy gushiness. In a nice show of continuity, all of the Storybrookers arrive in the Enchanted Forest wearing what they had on when Regina cast her Dark Curse. David even has his blood stained shirt on. Belle shares with Bae that she thinks the answer to getting Rumple back is his knife. This goes nowhere for the time being but is presumably important later. Because Rumple is coming back, Oncers. He has to! This exchange between Snow and Regina about Robin Hood. “Drink the thing the crazy guy just offered me? No thank you.” Emma’s response when Hook first offers her the potion. As if Emma didn’t already need some serious therapy, she just spent the last 8 months kissing a flying monkey.